More on Pachauri and background of Glacier gate in this article from Forbes India Magazine (05 March, 2010). “The dissenting lot believes that while the Survey of India has prepared accurate maps for the rest of the country, its maps for Himalayan glaciers are incorrect. Raina recalls the time he was the director general of the glaciology division at Geological Survey of India (GSI) in the 1980s. The maps were based on aerial photography done in November because of clear skies. Now measurements are taken during September but because of monsoon clouds aerial photography is not possible. “On August 4, 2009, Raina submitted his report. It contained 150 years of data collected by the GSI of 25 Indian glaciers. It said that the Himalayan glaciers and glaciers in the rest of the world have retreated and advanced irregularly with no direct link to warming or cooling of the earth’s climate. “This is one of the many issues of climate change science that we do not fully understand,” says Dr. Madhav L. Khandekar, a scientist based out of Canada who has been an expert reviewer of the 2007 IPCC report. On November 9, 2009, Jairam Ramesh released the Himalayan glacier document at a press conference in New Delhi. “There is no conclusive scientific evidence to link global warming with what is happening with the Himalayan glaciers,” he said. V ijay Kumar Raina is amused. The 76-year old retired geologist who lives in Sector 17, Panchkula in Haryana has been blitzkrieged by the media, government, world scientist community and the average citizen since December 2009. Why? Because he blew the lid off the Intergovernmental Panel on Climate Change’s (IPCC), headed by the charismatic R.K. Pachauri, claims that the Himalayan glaciers will be extinct by 2035. Raina’s life has taken a complete turnaround in the last six months. Like most retirees, Raina had followed a routine: Early morning walks, discussing politics, attending to his plants and working religiously on his book devoted to ‘tracing the work done on Indian glaciers’. He was on the receiving end of jibes from Pachauri who dismissed his claims as school-boy science. Now Pachauri has been keeping a low profile, his reputation at stake. However, neighbours call on Raina non-stop. There is no time to work on his book. But Raina laughs off the publicity. “The last one month has been absolutely maddening. Morning to evening, I am either talking to the press or answering questions on email and I haven’t been able to even touch my book. [But] so far I am concerned, the case is closed,” he says. What case? 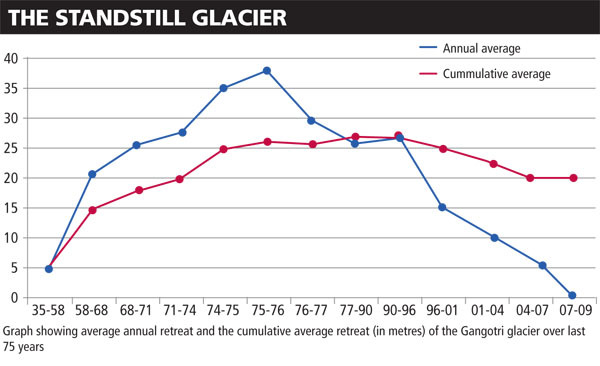 In its 4th Assessment Report released in 2007, the IPCC said, ‘the Himalayan glaciers were receding faster than in any other part of the world and, if it continued, the likelihood of them disappearing by the year 2035 and perhaps sooner is very high.’ This was the same year that the IPCC shared the Nobel Peace Prize with Al Gore. Now it has emerged that none of it was true. IPCC, which employs top scientists in the world didn’t do its homework and made unsubstantiated, alarmist claims. The organisation is on the defensive and its credibility is diminishing by the day. The whole chain of events started on another ordinary day in Raina’s life when he received a phone call. Raina, along with his wife Mohini, 73, was driving to a bakery shop specialising in Kashmiri sweets in Sector 23, Chandigarh when his mobile phone rang. “I get this call from some gentleman by the name of Dr. Subramaniam from the Ministry of Environment who says that ‘the honourable minister wants you to attend a meeting on Himalayan glaciers’. I hung up saying that I am driving and will talk to you later,” says Raina. Once back home, he called the number. “I told him that I am a retired man and I don’t know where I come into the picture,” adds Raina. He wasn’t sure he would go. But after much coaxing by his wife and the promise of the trip being sponsored by the ministry of environment & forests (MoEF), he finally agreed. On July 10, 2009, Raina went to the Paryavaran Bhawan, headquarters of the MoEF in Delhi. He wasn’t alone. There were around forty other scientists at the meeting. The Space Application Centre (SAC) had prepared a report on a few Himalayan glaciers based on satellite imagery which had been funded by the MoEF. Environment minister Jairam Ramesh wanted to know the view of all the scientists gathered in the room on the findings of SAC. “There was an open discussion where everybody was given the opportunity to air their views and most of the people didn’t agree with their findings,” says Raina. The dissenting lot believes that while the Survey of India has prepared accurate maps for the rest of the country, its maps for Himalayan glaciers are incorrect. Raina recalls the time he was the director general of the glaciology division at Geological Survey of India (GSI) in the 1980s. The maps were based on aerial photography done in November because of clear skies. Now measurements are taken during September but because of monsoon clouds aerial photography is not possible. However simple this may sound, it makes a lot of difference to the authenticity of the data collected. By November, the first snowfall has already taken place because of which it is very difficult to identify the outline of the glaciers. That’s why many glaciers outlined in the maps show much larger outlines than actually present. So, when the SAC compared the current size of glaciers using satellite imagery with the 1962 maps they obviously found a lot of shrinkage. “We told the minister that we do not agree what SAC says. At least that is our experience of the glaciers we have gone to,” adds Raina. Ramesh took notice and asked Raina if he would prepare a ‘white paper on the status of work done on Himalayan glaciers’. He was given a window of three weeks to complete the white paper. Raina claims he had no idea what a white paper meant. But he checked. “I found that a white paper means truthful expression of facts,” he says. On August 4, 2009, Raina submitted his report. It contained 150 years of data collected by the GSI of 25 Indian glaciers. It said that the Himalayan glaciers and glaciers in the rest of the world have retreated and advanced irregularly with no direct link to warming or cooling of the earth’s climate. “This is one of the many issues of climate change science that we do not fully understand,” says Dr. Madhav L. Khandekar, a scientist based out of Canada who has been an expert reviewer of the 2007 IPCC report. Raina vividly remembers the day the report was released. “It is surprising that even on the day when this document was released by the minister, a lot of press asked me questions but nobody bothered to put them in the papers because probably at that time they thought this fellow knows nothing… yeh to mantriji ne kar diya,” he says. He was partially correct. Not many took the statement too seriously in the beginning, except for some stray critics writing in the media. But the one man who took immediate note of it and reacted bitterly was R. K. Pachauri, chairman of IPCC. Pachauri came down strongly on the report. The following day, in an interview with The Guardian newspaper, he questioned the minister’s intentions behind releasing such a report terming it as ‘an extremely arrogant statement’. And he didn’t refrain from taking pot shots at Raina either. “With the greatest of respect, this guy retired years ago and I find it totally baffling that he comes out and throws out everything that has been established years ago.” He went on to say that such claims were those of “climate change deniers and school boy science.” Scientists across the world and six of them who shared their perspective on this issue with Forbes India say that Pachauri’s comments were out of order because they were very personal. In December, 2009, however, Dr. Murari Lal, a scientist and one of the authors of the chapter on glaciers in the IPCC 4th Assessment Report spilled the beans at a United Nations Environment Programme (UNEP) conference held in New Delhi at the headquarters of The Energy and Resources Institute (TERI). He said that he had cited the ‘Himalayan glaciers to disappear by 2035’ claim from a 2005 World Wildlife Fund (WWF) report. The implication of this “confession” was serious. Lal was saying his data was from a secondary source. The events quickly unravelled. WWF quickly responded and said it had, in turn, take the information from a quote in the New Science Journal given by Dr. Syed Iqbal Hasnain, who was then at the Jawaharlal Nehru University and who later became the head of glaciology at TERI. Hasnain, on his part, denied making any such statement. The source of the claim in IPCC’s report thus entered a blackhole. The moment this story made headlines, scientists and policy makers across the world started questioning IPCC’s credibility. Dr. Vincent Gray, a scientist based out of New Zealand who has been an expert reviewer on all IPCC reports ,puts IPCC’s current state of affairs in perspective. “This Himalayan story is so obviously fraudulent that it is surprising that people have only just noticed it. I blame myself that I should have noticed it long ago,” says Gray. But, quite a few people including the IPCC believe that the ‘error’ is not such a big deal. Mark Kenber, Policy Director at The Climate Group, is one such person. “The IPCC does not claim anything with 100 percent certainty. Clearly there hasn’t been sufficient scrutiny of all work covered, but that only two pieces out of tens of thousands have slipped through is remarkable,” says Kenber. However, others like Bjorn Lomborg, author of the book The Skeptical Environmentalist believe that over the years IPCC had assumed the status of almost a god-like organisation. “People thought that if it is in the IPCC, it is true. The guys were very sure about themselves. All three reports of the IPCC would do a lot of good with more transparency,” says Lomborg. It is the IPCC’s motivation and hand-in-glove nature with policy makers that have come into question. “It is not a scientific body and it has become a political body, dedicated to distorting evidence to support the view that human emissions are dangerous,” says Gray. Kenber, on the other hand, believes that it is inevitable that a scientific body so closely aligned with a political process will come under intense scrutiny. In reply to an email quesionnaire from Forbes India, IPCC said “there was regrettably a poor application of the IPCC Rules and Procedures” in drafting the paragraph on Himalayan Glaciers. “We reaffirm our strong commitment to ensuring that the author teams apply the IPCC procedures at every stage of the writing and review process in order to fulfil the IPCC mandate,” it said. In early 2010, Pachauri dismissed Raina’s report as ‘voodoo science’. But Pachauri himself is no scientist. In his earlier avatars, Pachauri indulged in more prosaic activities like overseeing operations at Diesel Locomotive Works, Varanasi and imparting lessons in economics to management students. This in no way undermines the man’s achievement though. He had done a very good job building TERI. Ever since the IPCC won the Nobel, Pachauri has acquired a celebrity status of sorts in the global warming scientific community. He is always on the move; either making speeches, attending conferences, presiding IPCC meetings or meeting policy makers. “The Nobel had its spillover. Earlier, he used to keep to himself but now he’s become more outspoken and sees himself more globally,” says another source who is a member of a TERI committee. As for Raina, he is unhappy that the work of so many scientists was trashed. “There are people working from Geological Survey, people working from Jammu University, people working from Jawaharlal Nehru University, IITs who had been working on this subject and this is the remark. That’s the tragedy,” he says. He knows what it is to be a field scientist. A Kashmiri Pandit by birth, Raina has spent more than 35 years studying Himalayan glaciers. And life as a glaciologist hasn’t been easy. He’s walked on foot for months to reach inaccessible glaciers, spent more than three months at a stretch living on glaciers surviving on ‘potatoes and onions’, led two expeditions to Antarctica, broken his leg when he fell into a crevice while coming down from the ‘Gara’ glacier in Himachal Pradesh with the nearest hospital available after five days march. He retired in 1991 with a last-month salary of Rs. 9,000. Ask his wife about how he feels about the whole thing and Mrs. Raina does. “He says that I just gave the facts of science; and I didn’t mean to confront anybody. Many people wrote to us saying that this is not right. Let him (Pachauri) say what he likes but after all I know what my capabilities are…Waise bhi jo bechara gir gaya hai, use laat kyon maarni,” she adds. The debate isn’t over but Raina is done with it. He still has plans to demolish a few myths. One of them is that the Gangotri Glacier in Uttarakhand gets affected by pilgrims taking bath in the Ganges or by army vehicles passing through. However, his next big thing is his book. This entry was posted on 21 februari, 2010 at 3:40 e m and is filed under Fri- och rättigheter, Miljö - Environment, USA, Yttrandefrihet. You can follow any responses to this entry through the RSS 2.0 feed. You can leave a response, or trackback from your own site.